To change the height (front portion) of the seat cushion, rotate the knob located on the outside of the seat cushion. To lower the seat cushion, rotate the knob toward the front of the vehicle. 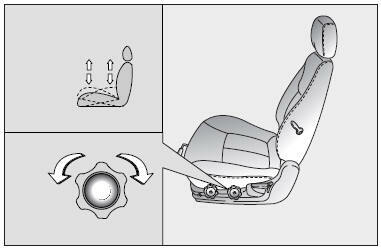 To raise the seat cushion, rotate the knob toward the rear of the vehicle. To change the height (rear portion) of the seat cushion, rotate the knob located on the outside of the seat cushion.